Check out the striking new styles that the athletes (and you) will be wearing in Madison. The Reebok CrossFit Games 2018 clothing range is now online. 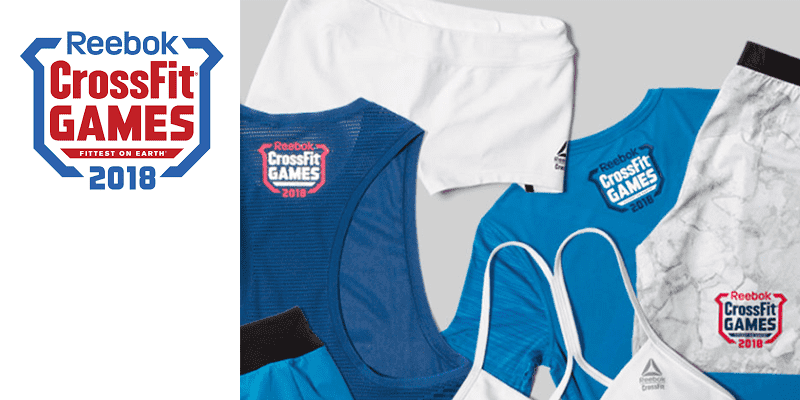 Each year Reebok and CrossFit work together to release a new line of products in a uniform style, helping to add to the distinctive flavour and visual identity of that occasion. The Reebok CrossFit Games 2018 clothing range incorporates a deep royal blue, black, white and marble print grey. The 2018 Reebok CrossFit Games collection is available at store.crossfit.com and Reebok.com. What do you think of the Reebok CrossFit Games 2018 clothing? You’ve seen it, and guilty like the rest of us, gawked over it with pangs of jealously. We call it: The Stash Surge. The Athletes arrive for registration and the Games looms aheads, but our social media feeds are flooded with brightly coloured Nanos, sports bras with extra straps, shoes we’ve never seen before and enough apparel to clothe a country. Like us, you may be wondering why one athlete needs so much stuff and what those colour schemes are all about? Sponsorships aside, Outfitting 560 athletes is no easy task; it is essential to optimising athlete’s performances at the CrossFit Games. From the ocean to the turf, sand to the lifting platforms, athletes require kit that matches the demands of the workouts and their environments. Reebok apply the same tenacity, humility and passion to developing and enhancing their gear as do CrossFit athletes in the way they adapt and perform to the challenges presented to them. Some of these you may recognise, some you may not. Games competitors have to be prepared for the unknown and unknowable and hints can often be given at the gear they are given. For example this year, we saw more workouts taking place within the stadium, down on the turf. Many athletes could be seen donning their All-Terrain Super 2.0s for extra grip, stability and speed. This year we saw some of the toughest programming at the Games we’ve seen yet. That and the combination with some harsh weather conditions, appropriate apparel can hugely impact an athletes performance. Reebok needed to craft gear that would assist the athletes. Despite the differences between workouts and conditions, there was one common denominator shared by all athletes throughout, sweat. 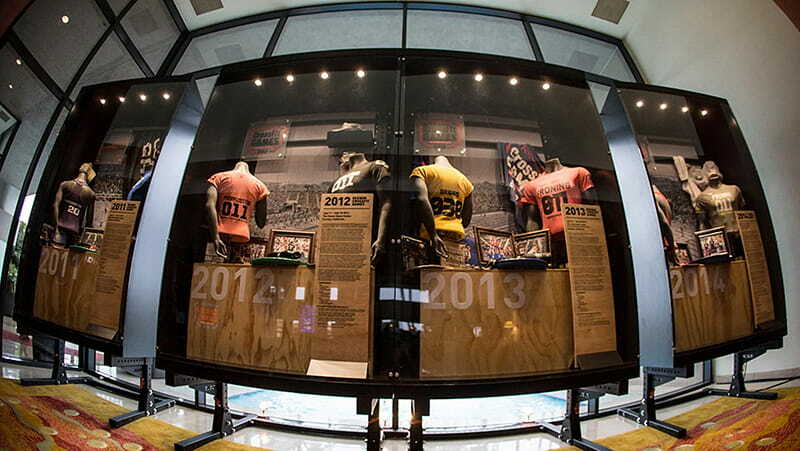 Through their partnership with DuPont™ Kevlar®, Reebok created the ultimate in durable apparel. Being lightweight, moisture-wicking and with sew-free seam construction, their apparel provides unprecedented freedom of movement so that regardless of where the workouts take place, athletes can breathe easy. Those snazzy sports bras you spotted also had their functional purpose. Reebok gifted a total some of 2,520 sports bras to female athletes this year. Crossfitters come in all shapes and sizes. Outfitting them for their greatest athletic challenge is something the team at Reebok take considerable care over. 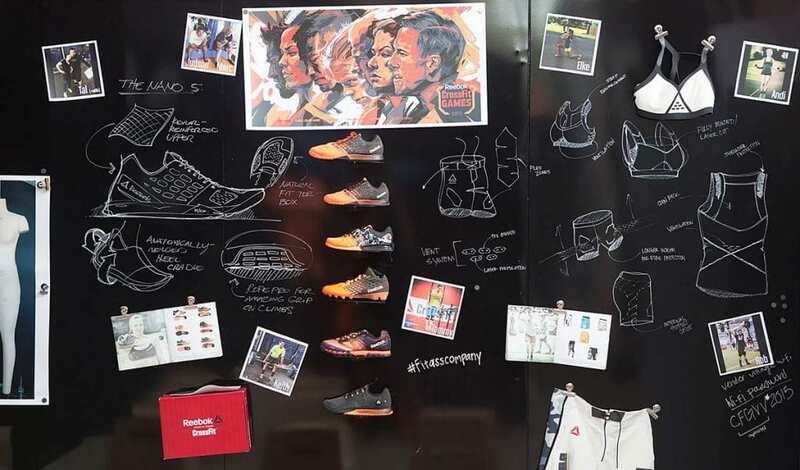 During the several days of outfitting, the Reebok Product team collaborates with professional costume designers and athletes to make alternations there and then to provide custom fit, so athletes look and feel their best on game day. Permanent pressing and heat transfer takes place onsite for last-minute athlete and team requests for new name and number combinations. Feeling good about ourselves mentally allow us to perform at our best. The same goes for Games athletes, performing in front of thousands of people. The bold colour schemes of the Games gear makes us stand out from the rest. Inspired by Motorcross, surfing and US military clothing, the aim of the Games gear was to achieve a uniform for each year. 2012 we saw the charged green, last year the electric yellow, this year the luminous orange. The result is a more connected athlete uniform, with the colour giving the gear a chronological stamp to which Games it belongs too. Some 13,000 customised pieces of gear was handed over to the athletes this year at the Games. As the Games evolved, so did the product; particularly the Nano. In 2013, Cordura® yarns were introduced into board shorts, and the Reebok CrossFit Nano 3.0 engineered with DURACAGE, ensured protection for anything CrossFit® could throw at the athletes. In 2014, Without compromising protection, greater breathability and flexibility was engineered into the Reebok CrossFit Nano 4.0. The range Reebok offers us is the result of direct feedback of the fittest athletes on earth, since being the exclusive outfitter of the Games in 2011. So what are your thoughts on The Reebok CrossFit Games 2018 clothing?